Project Description: This lovely lace cloth could be used as either a washcloth or a dishcloth, whichever you prefer. I’ve tested it for both purposes (although not extensively, yet) and was satisfied with its performance either way. I originally planned to use my project sample as a dishcloth. Then I started having second thoughts about that, after remembering how many “that’s too pretty to be a dishcloth” comments I’ve received over the years. But, you know what? I’ve decided that, for me, nothing’s too pretty to be anything. 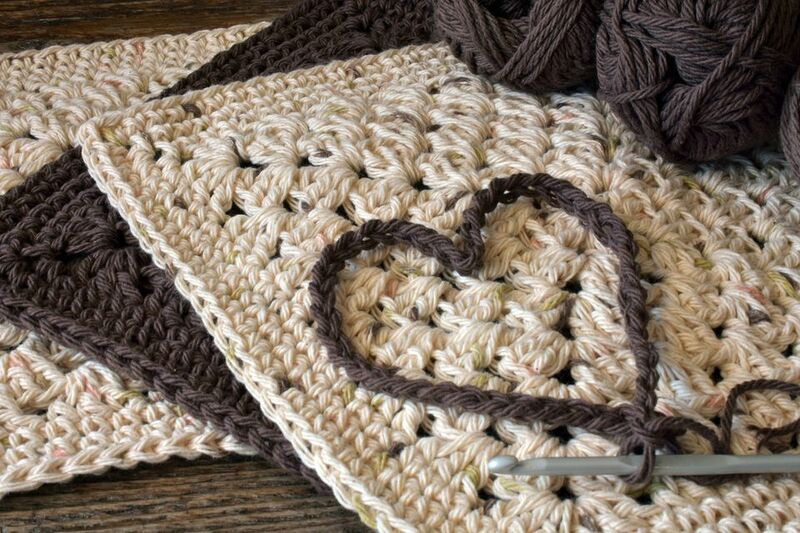 I ask you this, crocheters -- should we purposely make something ugly, when its sole purpose on earth is to be cleaning and beautifying the dishes and utensils we use every day? I think not. I confess that I did have second thoughts about using such a lacy piece to wash forks and knives with – but I tried it, and it worked fine for me. Your mileage may vary. If dishwashing is a task you delegate to someone who can’t be trusted with knives and lace used together -- and I realize there are many such people, possibly even including my husband – this cloth may better serve your household as a washcloth instead. As a washcloth, one of this cloth’s main advantages is its beauty. It is definitely gift-worthy, and it would be right at home in a luxury spa-style gift basket that you could give to just about any lady on your gift list – mom, sister or grandma, friends, colleagues, teachers, etc. It isn’t just for show, however; it really does function as a washcloth if you decide to use it in that capacity. The first time I tried washing my face with it, I was delighted with the soft, squishy texture of the yarn on my face. This washcloth isn’t at all the same as the terry cloth washcloths I was accustomed to using before I began crocheting my washcloths – but it’s different in a good way. This cloth began its life as a swatch I was crocheting while working out how to do the puff lace stitch with half double crochet vs. If you like the stitch but you’d rather use it as something other than a washcloth/dishcloth, I invite you to grab the free stitch instructions and give it a try in the project of your choice. Yarn: You’ll need a 50-gram ball of sport weight cotton yarn to crochet one washcloth/dishcloth with its edging. I crocheted my project sample using Knitpicks Simply Cotton yarn in the “Marshmallow” color. This yarn has about 164 yards per ball. Please feel free to substitute yarns if you like. Crochet Hook: Size G /6 – 4.25 mm or size needed to obtain the correct gauge. Tapestry Needle: A tapestry needle is optional, but it is helpful for weaving in ends when you are finished crocheting your washcloth. If you don’t have one, it’s possible to use a crochet hook to weave your ends in, but I recommend using a tapestry needle for this purpose if you can. hdc v st = half double crochet v-stitch; see "special stitches" section below for instructions. = brackets denote a set of instructions to be repeated. Repeat the instructions inside the brackets the specified number of times. * = asterisks also denote a set of instructions to be repeated. Finished Size: Before its first washing, the finished washcloth measured about 9.5 inches wide by about 10 inches long, including the edging. I made my washcloth length slightly longer than its width, hoping to accommodate for length shrinkage, which is typical with the yarn that I used. Gauge: It is not critical for you to match my gauge exactly to achieve good results with this pattern. Repeat the same steps again until you have 5 unfinished half-double crochet stitches in progress. There will be 11 loops on your hook all together. To close the stitch, wrap the yarn over your hook, grab it and carefully pull it through all the loops on your hook. This version of the v-stitch is made just like a standard v-stitch, with one exception: you'll use half double crochet stitches instead of double crochets. Hdc in next st to be worked. Row 1: Hdc in 3rd ch from hook. [ch 1, skip next 2 sts, hdc v st in next st, ch 1, skip next 2 sts, puff st in next st.] Rep the sequence in brackets across the row. At the end of the row, your last sequence will end with a hdc v st. After that, work 1 hdc in each of the last 2 sts. Row 2: Your turning chain counts as the first hdc st in the row. Hdc in next st. [Ch 1, puff st in next hdc v-st, ch 1, hdc v-st in next puff st, ch 1.] At the end of the row, work a puff st in the last hdc v st, then work 1 hdc st in each of the last 2 sts. Row 3: Your turning chain counts as the first hdc st in the row. hdc in next st. [Ch 1, work a hdc v-st in next puff st, ch 1, work a puff st in next hdc v-st, ch 1.] Rep the sequence in between brackets across the row. At the end of the row, your last sequence will end with a hdc v st. After that, work 1 hdc st in each of the last 2 sts in the row. Repeat rows 2 and 3 until the cloth is the size you want it to be. An edging for this dishcloth is optional. It’s useful as-is without an edging, so feel free to skip the edging and go right to the finishing section below if you are satisfied with the dishcloth at this point. 30 sc sts down the side of the washcloth. Ch 2 to form corner. 30 sc sts across the lower edge of the washcloth. Ch 2 to form corner. 30 sc sts up the other side of the washcloth. Ch 2 to form corner. 30 sc sts across the top edge of the washcloth. Ch 2 to form corner. When you have finished crocheting the edging, you should end up with 10 puffs along each side and one puff in each corner for a total of 44 puffs. If the edging pictured isn't your style, please feel free to try a different edging instead.